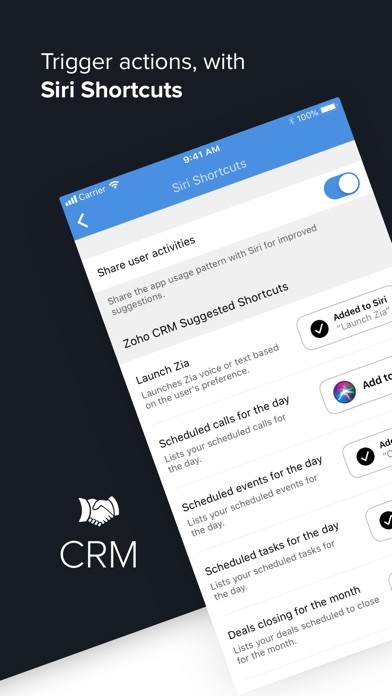 Zoho’s mobile CRM helps you stay on top of all your sales activities. Be a pro lead manager by efficiently tracking and following up on leads or that sales manager that everyone envies with your top notch contact management. Turn your phone into your personal sales assistant to help you in your field sales. 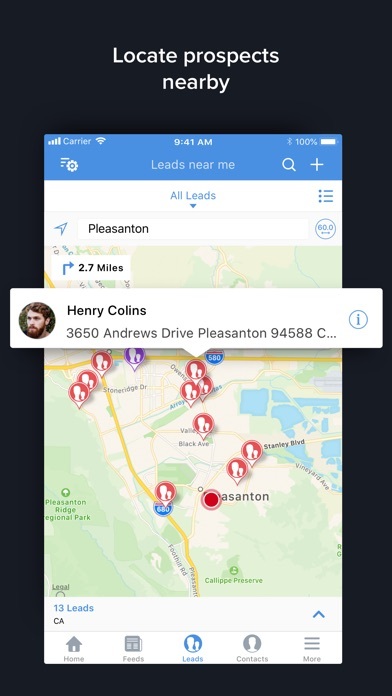 Increase sales efficiency with the mobile CRM by locating more leads, scheduling more meetings and closing more deals. Features: - Start your day with a clear overview of your scheduled tasks, events and calls. 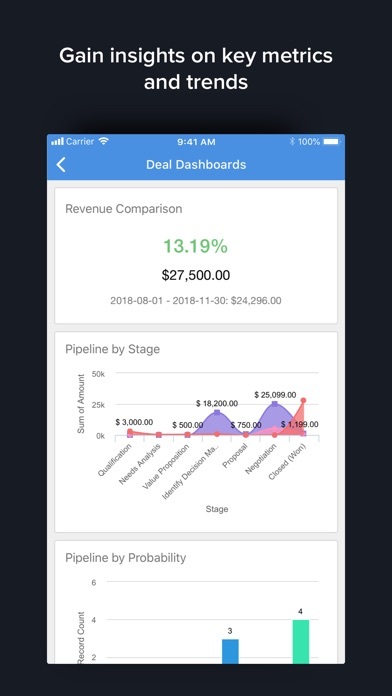 - Stay up-to-date and gain insights on key metrics and sales trends with Dashboards. - Log calls and schedule follow-up activities. Attach voice notes and files to deals with ease. - Set reminders, get push notifications, and be sure to never miss an activity. - Check in to record your visits at customer locations. Collaborate with your team through feeds using @mentions and much more. - Access and modify your information even when you're offline. It gets automatically synced when you are back online. 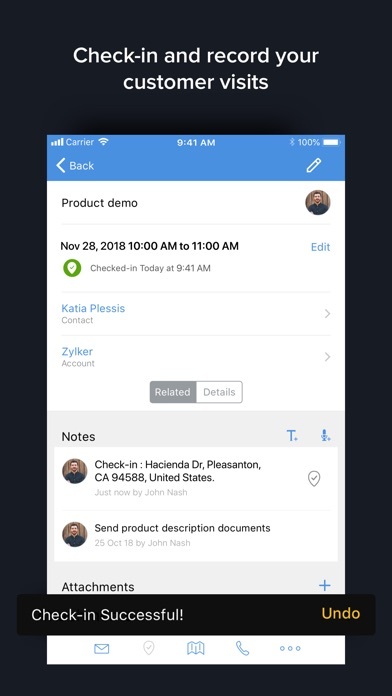 - Manage your end-to-end sales cycle with Zoho CRM’s mobile app. Hello, sorry about the comment but I have the last version of Iphone and also the app. Everytime I try to open it, lasts 2 seconds and closes automatically. I can’t tell you how impressed I am as a business owner with Zoho. I am not IT, but most of even complex options I can do with the help of their support. The program itself is beyond solid, it has dozens of practical partner programs (we use salesiq, forms and others), but the most important feature is their customer service. Always someone available within seconds through phone and chat. Always quick to help and solve. It’s a beast of a program but it has to be so it does everything we need and then some. Not really useful especially compared to the desktop version. I wish it was fully integrated like the desktop version. Unable to use the search icon on an IPhone or IPad without the app crashing. Zoho suggested I reset the app. After resetting, it will allow me to search for a couple of leads/contacts but then goes right back to crashing. All of our employees that use an IPhone have the same issue and it’s been going on for a few months now. I can’t understand why the problem hasn’t been fixed yet. Top 10 reasons NOT to download this app(yet!)! I have a really high opinion of zoho but they have a long road ahead of them. 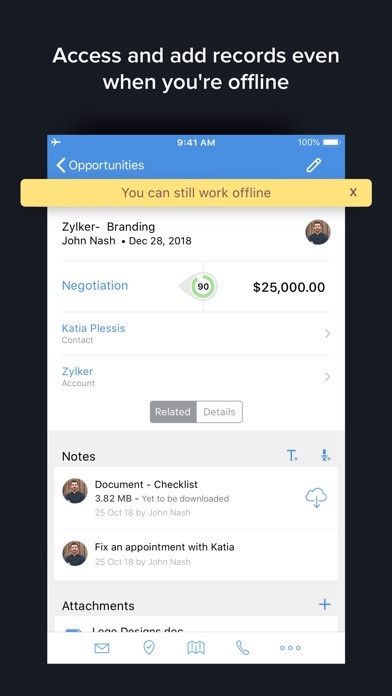 If you are like me and are constantly on the go with the rest of your team and need a crm on-the-go then I recommend you you read on before making a decision. Zoho will probably respond to this review saying they are working on some of these issues and others are in the road map for upcoming features all else he’ll pass on to his development team as they say to every other issue for years. They have great customer service which is why zoho so popular and I would give 5 stars for their service. But service without a product is just a nice group of people. 1. While on desktop you can set up sms and call using business number no such option exists in mobile. (You can call from you phone but then what’s the point of say setting up Twilio if it’s not usable in all platforms). Yes this means no incoming calls from your zoho phone you set up on your phone . Zoho has been promising to update this for over a year yet no sign of any progress 2. Company setup not possible. 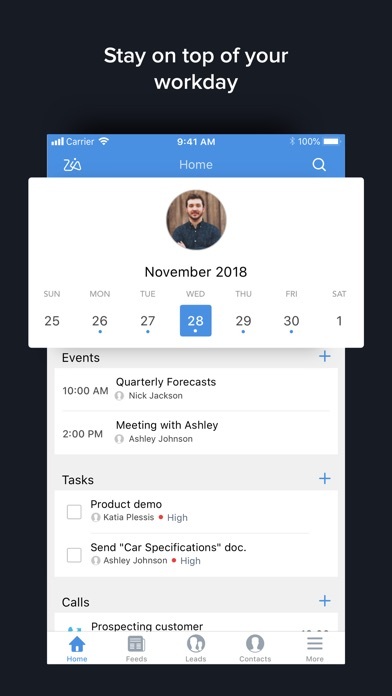 Each user/app must set their own custom layout which takes a while to set up and only those who are familiar with how to organize tabs can do so. If you have many employees this is not best option at the moment. Zoho has no intentions of adding this feature. 3. Inaccessible information. Many information needed can only be seen on desktop. For example contact roles in deals, many custom related lists, and attachments (via google drive). 4. Unable to cancel event from mobile. While desktop this is doable on mobile you can only delete the event. 5. No custom notification options. Unless this is through an activity or system defined you can not set up custom notification. 6. Unable to share a contact from in the app. You need to set up sync to google contacts and share from phones contact lists. 7. No record images. You can’t set up record images. By default you can only see users profile.while one desktop you can set up record images mobile you don’t see anything. Keep in mind zoho only has a single image field. Which bring me to #8 8. No image Libary. You only have 1 image per record there is no way to view multiple images or even enlarge the record image. I’ve tried integrating the google drive which would show the image as a image icon in related list it is not possible to see the image using Zoho’s integration . Unless you do what I did and just set ups url to redirect you to google drive. As a bonus, it’s also not possible to see record images in related list although that would be amazing but this is not possible on desktop version as well. 9 Unable to control data show on related list. The related list only shows the record name and record owner. You can not select what info is shown in a related list(for example, prices, account product is under...) 10. No custom actions/buttons. Unless you are in record details and you select “more” which will show you custom. Buttons it is not possible to view/use buttons in list view . It would be nice to have feature to add action like slide left or right but that’s currently only possible in creator. Not intuitive and lacking explanations. I used Salesforce for 15 years until this week. This CRM is superior to SF in many critical ways (I was the system admin for our SF as I am for Zoho). I found SF overly focused on the wrong areas, whereas this system is solidly focused on features that deliver information I require, without the hype. Very refreshing. Easier to go online and use the website than the app. The app lacks features and stability. Have been waiting months for the “new” app to come out. Not enough to deserve 4 stars. Zoho is a workhorse, tons of support, infinitely customizable (almost) and the app is free. I’ve been running my business on Zoho since 2012.